IDJ: With reference to HF’s article Eastern Extension Telegraph Company – linking HK to the world this picture shows a cable ship moored off Causeway Bay in the late 1960s. The ship was a long-term resident and rarely seemed to move. I understand that it belonged to a Danish cable company. HF: You can see the ship’s name but not quite read it. Can anyone tell us its name, of its time in HK or elsewhere and what happened to it? As it happens, I stumbled on the probable answer to this question the other day while researching for a Gwulo post. So she’s likely the larger of two ships built in 1922 and called Store Nordiske, and was stationed in Hong Kong from an indeterminate date until 1967. After that, I can’t find any record, although I’ve barely searched as yet. She was the second and larger of two cable-laying ships made in 1922, but they were the Edouard Suenson and the second Store Nordiske. The first Store Nordiske was an earlier ship that was also based somewhere in the Far East. My father William Elmgreen was an engineer on the second Store Nordiske and was based in Shanghai, 1927-1940. In May 1940, just after Germany had invaded Denmark in April 1940, both cable steamers the CS Pacific and the CS Store Nordiske (Great Northern) left Shanghai for Hong Kong, On arrival, they pulled down their Danish flags and raised the Union Jack. They continued their work of repairing undersea cables. 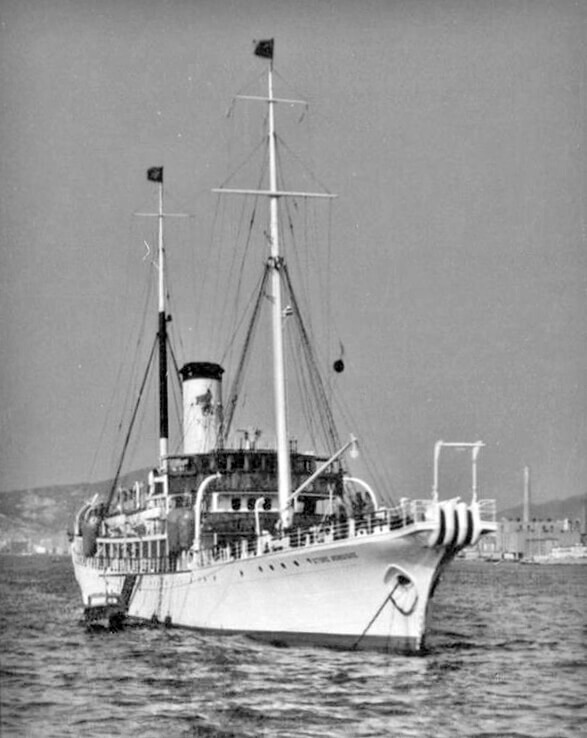 The Pacific was later stationed at Singapore, relieving the British Cable Steamer, The Cable, and then went on to Australia, returning to Singapore in 1941..